the SL-4000 brings unparalleled level of comfort and adjustability. Redefining gaming chairs, the SL-4000 brings unparalleled level of comfort and adjustability. Gamers spend hours each day in front of a computer, the new SL-4000’s high density padding and contoured backrest allows for an extremely comfortable gaming experience. Designed to give wide range of adjustability that gives gamers the best comfort and support in every gaming position for extended period of time. High backrest is designed to provide neck, shoulder and lumbar support. Cushioned and contoured to the shape of the arm with adjustability in 4 directions gives support to the gaming arm in every position and prevents repetitive stress.Ergonomically designed to provide support to the forearm, relieving muscle strain and fatigue from the shoulders and taking pressure of sensitive areas of the wrist. Features independent back angle option. An angle-adjustable backrest to help you adjust your sitting position throughout the course of your gaming experience (up to 150 degrees). Elegant Exterior The SL4000 is made of high quality PVC leather, which makes it extremely durable and gives the chair a luxurious look. This material is easy to clean and maintain due to it’s stain and water-resistant characteristics. The SL4000 padding is made of high densed resilient foam, which adds great support and seat comfort to the chair. The open-cell breathing structure, makes sure that heat arised from the human body temperature won’t get trapped inside. This gives great comfort to the user even when seated for extended period of time. The SL4000 is constructed from a steel frame that assures a solid structure. The aluminum alloy 5-star base keeps the chair solid, stable and lightweight. Assembled with a Class 4 gaslift, for better durability and ease of use. Our Class 4 Gas Lift has thicker walls to accommodate the higher pressure and stability. The Vertagear S-Line comes with a patent pending mechanical structure that requires no more than one person to assemble. All Racing Series chairs are equipped with our Penta RS1 casters. The custom racing style casters are coated with PU for soft and smooth gliding on any surface. (color matching chair). More links for "Racing Series S-Line SL4000 Rev. 2 Gaming Chair Black/Blue Edition"
"With a steel frame and high density foam support material covered in PVC leather, the SL4000 is a sturdy and hard wearing beast. ...All in all, we think that the SL4000 is a cracking chair for the money. ...we have no problem in awarding the SL4000 a gold award and, in recognition of its racing pedigree, the much coveted Gamers Choice award." "For a launch product I’m very impressed and suspect we’ll see some more great products from Vertagear in the future"
"The Vertagear SL4000 is a chair to complete your gaming rig, gaming room and total gaming experience. It will cost you a princely sum of £215.00, but it’s worth it! Unless you have a stand-up gaming style, think about how many hours you sit down doing what you love the most; that alone makes it priceless." "I was extremely excited to receive this chair, I’m a lover of the cheap chair, spending less than £50 at a time and my back hates me for it. This chair costs over 4 times that amount and the quality is leaps and bounds over them in every aspect." 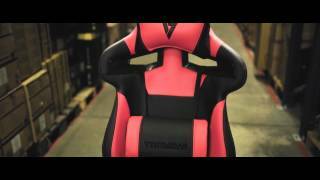 "Vertagear’s SL4000 is an exemplary office chair. This stylish, well-designed piece of furniture will add class to your office while quarantining comfort for extensive periods of time." 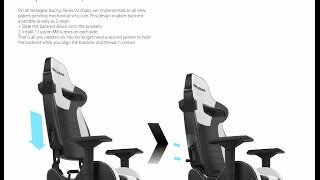 "We have been asked about gaming chairs time and time again. Now, we finally have an answer for you. If you are looking to pick up a gaming/racing seat, the SL4000 has our vote."